Working from home on a freelance basis (on a third-sector website) for an hourly rate, I need to keep my nose to the grindstone. I’ve been working from home for at least one day a week for the past three years, and I’ve never found it a struggle to fulfil the first part of that phrase. No ‘working’ from home; I have actually been doing my job. My working pattern is different from what Boris Johnson described as ‘skivers’ paradise’. However, my working position is probably ergonomically unsound, whether I’m working upstairs at my desk with a mouse, or downstairs on the sofa without (or even standing up in the kitchen), and given the recent scary reports that sitting down can kill you, I need to get up and move more. It’s very easy to get so immersed in your work that you don’t notice time passing. Then I came across the Pomodoro technique, a time management method developed by Francesco Cirillo in the late 1980s. It’s very simple. You work for 25 minutes, then take a five-minute break. During that break I get up and do something, anything. For example, weeding in the garden, chopping veg, playing with the cat, washing my hair… anything that doesn’t involve my keyboard. I use Tomato Timer, which beeps at the end of your 25-minute pomodoro, and the end of your five-minute break. And why ‘pomodoro’? Apparently Cirillo’s original timer came from his kitchen and was shaped like a tomato. My partner’s been riding motorbikes for years, and can’t understand why I’m reluctant to go with him. Zipping past traffic jams, the sense of freedom, the wind in your hair, feeling like you’re flying… as a cyclist I understand where he’s coming from, but I get distracted by images of impending doom flicking through my mind: flying through the air, telegraph poles, large lorries and careless drivers… Yesterday I decided to get over myself and get on the back for a long ride: 70 miles through the Kent countryside. And I’m happy to report no mishaps, other than a sweaty back, sore adductor (inner thigh) muscles from gripping, and hurting hands from holding on. The length of the journey meant I had time to register what we were passing (12ft sunflowers, ripe wheat fields, an unexpected glimpse of the sea and the offshore wind farm, the smell of woodsmoke), and savour the experience. I’ll definitely do it again. When I say ‘hot’ I don’t mean grilled. This halloumi had flecks of chilli instead of the usual mint. I bought it by accident, and when I got it home I thought the pink spots were the same mould that you get on yoghurt. Then I read the label. Baked with courgettes, tomatoes and peppers, it was noticeably and nicely spicy. 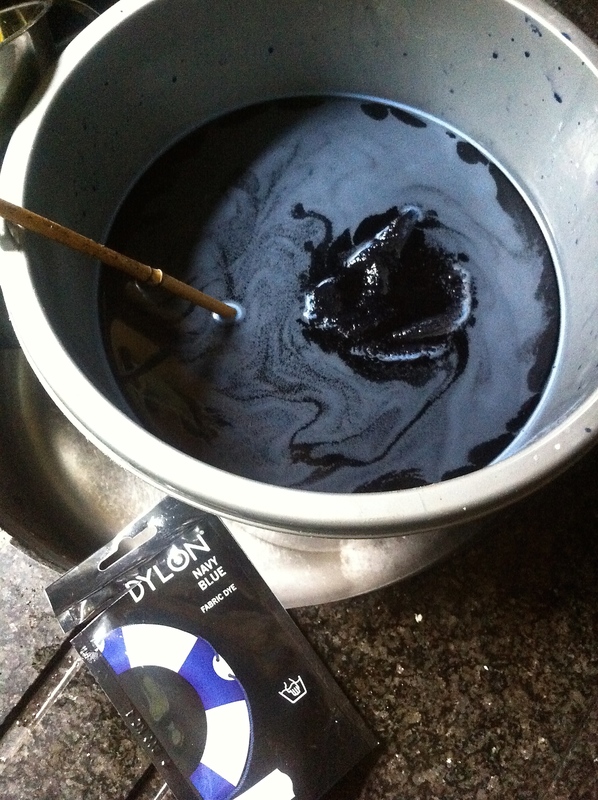 My previous experiences with dyeing haven’t been successful. This is because my approach to such matters can be somewhat slapdash. I can tell you from personal experience that what it says on the packet about suitable fabrics for dyeing is pretty accurate! 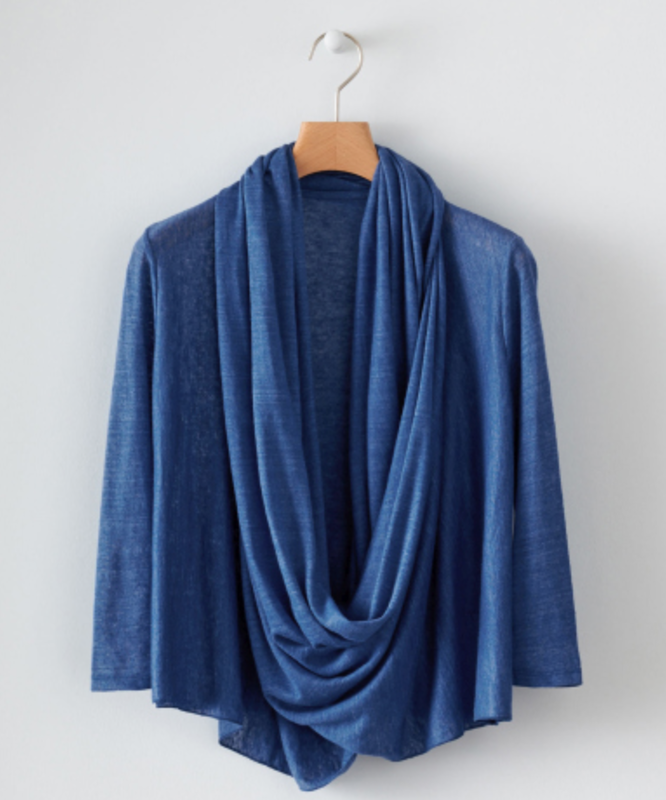 However, I was given a garment from Poetry that I liked the shape of (a one-piece cardigan with a loop of fabric hanging in the front that you twist over your head to give a ruched crossover front and lapel effect. If it has a specific name, please let me know! ), but didn’t like the peachy colour of. Happily, it was made of a jersey-effect woven linen. Linen being a natural fabric and therefore perfect for dyeing, I bought a packet of Dylon Navy Blue dye, and followed the instructions. I washed the top, left it wet, weighed out salt, mixed dye and salt, filled a bucket with water, added the dye, stirred and stirred and rinsed. It needed to dry out of direct sunlight so as it was dripping wet it ended up draped over the olive tree at the end of the garden. And I have a new addition to my wardrobe, looking like the one above, but darker blue. I’ve been going to yoga classes on and off for years: lunchtime in the former Labour Party HQ, lunchtime near the former offices of Time Inc, formerly IPC), evenings at Morley College (Brian, a great teacher, is also the proprietor of The Button Queen off Marylebone High Street), lunchtimes at Triyoga in Soho, naked on a Greek beach, and selected postures in the office along the way. Now I’m working from home, and currently going to local yoga and Pilates classes three times a week (and it feels so good!). 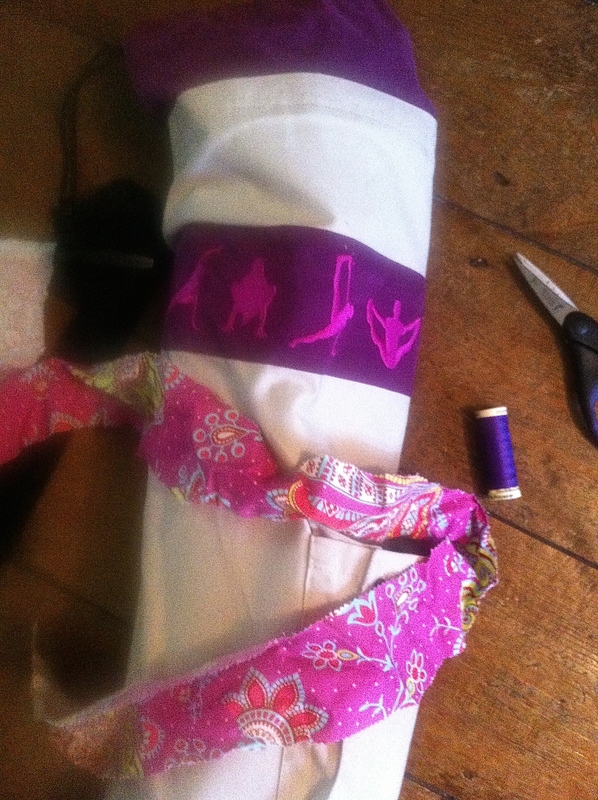 This means that my trusty yoga mat bag has been in my line of sight more than before, and that means that the terrible embroidery of yoga postures – some are so inaccurate as to be anatomically unachievable – has been irritating me more than before. It needed to be covered up so I found a scrap of fabric and I’m hand-sewing it on, tucking in ends and sides as I go. It’ll be finished today, ready for Pilates tomorrow morning.